Take your time on the Great Ocean Road, says Raman Kumar. Find an idyllic summer weekender along Victoria’s Great Ocean Road. “The best weekend away is made up of the following ingredients; A ’67 Austin Healey, warm weather and the surf in Lorne. Everyone longs for that exciting, un-mapped weekend of exploration. Call it the Thelma and Louise syndrome. And for this, the Great Ocean Road meandering from Torquay to Warrnambool is as good a place as any and better than most. The holiday hotspot of coastal Lorne, leaning against the green of the Otways, is striking. Rivers and waterfalls are within close proximity and lookout ledges provide excellent views. The waters of Loutit Bay welcome keen surfers trying to master the Tom Carroll technique. In fact all along the Great Ocean Road you’ll find excellent beaches, so jump in your convertible and drive till you find a break you haven’t yet broken. Lorne’s lanes are crowded on holidays and much of the allure can be lost. Avoid the silly season if you can and opt for a non-peak weekend, the ideal time to bird watch and creep up on little echidnas as you trek through the 50km of walking trails in the Otways. So, if you’re looking for a spot to get away from it all, where reflection is never-ending, silence is cherished, writing in your journal is the go and a hand of bridge can be played without interruption, look no further. Sometimes the hinterland, lush vegetation and fresh coastal breeze is all it takes to slow down your pace. The Great Ocean Road, quite aside from the cruising, is perfect for discovering new coves and revisiting ones you built sand castles in as a kid. 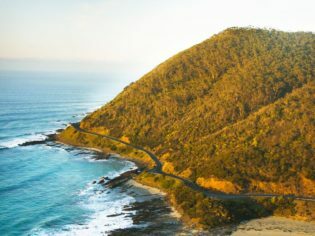 Just south of Lorne, beside the Cumberland River mouth, take a walk along the river and past clifftop scenery looking out towards Cumberland Cascades. A beautiful 3.5hr return trail. Where: 150km south of Melbourne, about 2hrs drive. What to take: Spare board wax.